The “enemy” ship from the fan-favorite film Star Trek II: The Wrath of Khan returns… new and improved! Many previous inaccuracies have been addressed in this release, to appeal to modelers both old and new. 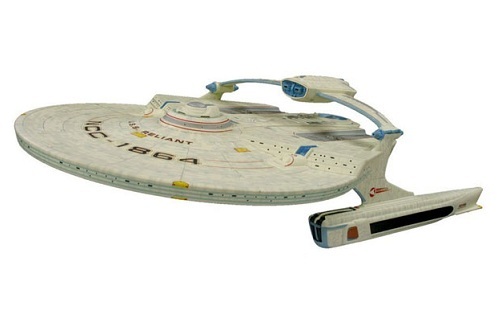 This 1:537 scale USS Reliant NCC-1864 Model Kit features adjusted tooling with a removed saucer with ridges, thicker saucer, and heightened bridge dome, a dome-styled base, and marking decals. Molded in white and clear parts, this is a skill level 2 model kit that requires glue assembly and paint. Price: $35.19 & eligible for FREE Super Saver Shipping.